Hollywood's "300" film poster boy Zack Snyder needs "Watchmen" as he has developed a strange problem. Like a bad boy, he has been spending too much time playing video games. In "Sucker Punch", he sacrifices good storytelling and filmmaking for video gamey special effects. Somewhere in the film he forgets that he is a director, and not an effects supervisor. It is hard to tell the story of "Sucker Punch", not because it transcends a conventional story, rather because it does not really have a story to tell. A girl (Emily Browning) is sent to a mental asylum by an evil stepfather after she accidentally shoots her younger sister while trying to protect her. Her memory is scheduled to be erased, but before that she delves two layers deep into her mind in an attempt to free herself and a few other girls. The film opens beautifully with a five minute montage that promises an entertaining, comic book touch to the film. Sadly, it's a no-go zone beyond this point as "Sucker Punch" becomes a video games meet "Inception" and "Inglourious Basterds" with women in the lead. The problem is that Zack Snyder, who surpassed existing limits of special effects with "300" and "Watchmen", forgets that the two films had a beautiful story to back up the effects. That works. But if one expects excellent special effects to back up a non- existent story, you get punched for being a sucker. Despite some commendable soundtrack to hoot, it is mostly loud enough to irritate and the filmmaking seems crass and the product of a juvenile mind. The only positive would be for serious video game buffs, who would identify sections of the films with their favourite games. The girls in the film have one job - to look vulnerable and lethal at the same time and they do this convincingly. However, Oscar Isaac, as the evil guy who runs the place, proves himself to be an actor in the reckoning. For those looking for cool special effects and martial arts, there's enough. For those looking for extreme slow motion next to fast-forward zooms pans to enhance action, there's enough. Despite these, the film runs on empty. How Zack Snyder manages this, perhaps requires as much genius as making a "300" or his highly underrated masterpiece "Watchmen". Perhaps Zack, who wrote the story, should not try to film his own stories but visually interpret others with his evident genius for doing so. Films once pandered to the simplistic black and white notion where good battles bad, and nad loses in the end. Literature, even ancient ones, knew otherwise. Cinema, the youngest of the art mediums, has taken longer to tread these grey areas. Yet, it is disconcerting to notice that popular cinema still continues on its simplistic trip, despite showing promises otherwise. The Eagle is one of the best examples of that. Army General Marcus Aquila (Channing Tatum), during Roman civilization's golden age, is a progressive Roman by every standard. He leads from the front, is independent in thought and does not believe in the jingoistic politics of the time. 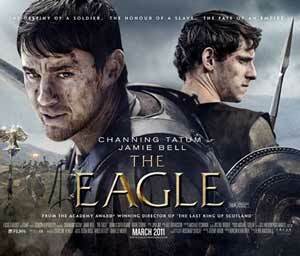 His only ambition in life is to get back "the Eagle", a standard made of gold that was the symbol of Rome. His father, leading a charge of 5,000 men towards the northern territory, thought to be land of savage tribes, had lost "the Eagle" two decades back and had shamed the family. After an honourable discharge due to an injury Marcus along with his slave Esca (Jamie Bell) tours the northern lands to get "the Eagle" and win the family honour back. For a little while, it does seem that the Eagle will transcend its boundaries and address the grey areas to which the world and its morality belong and give a view from the other side of the fence. In the northern region, far from civilisation, Marcus is taken slave by his slave Esca, and experiences first hand the humiliation of being one. Here, and in many other parts, the film by being sympathetic towards those who are thought of as savagess could have attacked the notions of right and wrong and might being right. However, it lacks imagination or political de rigeur, and sticks instead to typical Hollywood "apartheid" - thus making it average and a politically very wrong film. Politically put in today's context, the film justifies the superiority of the western world over the eastern one. By its logic, every American and European invasion is justified. Be it the occupation of America by the Europeans beginning 1492 or European conquests of the world later, or America's various wars, including Vietnam and Iraq. The film thus treads on a dangerous ground politically and its morality is of a propaganda film as it puts the sole onus on determining right and wrong on the mighty west. And that is indeed a great loss, considering the ensemble of actors, technicians and the scope that was possible from the film. That said, the film has cinematography to boot, and the performances leave nothing much to complain about, especially star Jamie Bell as the loyal slave and sidekick. The Billy Elliot kid has grown up, sadly not the film. Unlike a comedy, or a rom-com, or a mystery, life is not one dimensional. Life, if you can describe it thus, is a mix of many cinematic genres. It is hence not surprising, that of late, there have been films that cannot be compartmentalised into any specific genre, but can be called 'mixed-genre' film. To experience first hand, and thus understand the potential of this 'new' genre, go watch "Barney's Version", a pinnacle in its own right. 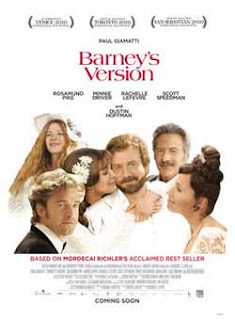 "Barney's Version" traces the tragic, comic and mysterious life of Barney Panofsky (Paul Giamatti) - a politically incorrect, impulsive and irascible television producer owning 'Totally Unnecessary Productions' who goes through three marriages and one true love. As fate would have it, he finds the true love of his life on the day of his second marriage. The woman - Miriam (Rosamund Pike) - is a guest at his second very Jewish wedding. He falls, irrevocably, irretrievably, irresistibly in love with this woman and chases her. But in the process, he becomes the prime accused in the murder of his best friend, Boogie (Scott Speedman). But would he get to keep the woman of his dreams? There are so many things and aspects that the film handles, that it is impossible to categorise it into one straight jacket genre. It is one of the most original comedies in recent years. Yet, it is one of the cutest romantic films you'd have ever seen and has a murder mystery that baffles you till the very end. There are many films that have been attempted like this, but none with the emotional and cinematic sweep of "Barney's Version". As a discerning audience, you are left with your jaw wide open wondering how virgin film director Richard J. Lewis, successfully manages so many spaces in the time span of less than two hours. The film is also a connoisseur's delight as it is peppered with extraordinary performances from its leads and supporting cast. Paul Giammati is stellar in his portrayal of an ordinary man in perennial anguish over one thing or the other. Minnie Driver in a small role excels as a consistently henpecking wife. Rosamund Pike exudes sexuality and grace and Dustin Hoffman gets your laughing gases warmed up as the idiosyncratic, Jewish ex-cop, sidekick father of Barney. The film has more genuine humour than seen in any film in recent years. And this has to do not just with the perfection of its actors, but the perfection of their timing with each other. And that has to do as much with their skills, as director Richard J. Lewis's apt handling of key moments. Based on a popular novel by Mordecai Richler, it will make you wonder whether it is a comedy, or a romance or a who-done-it film. But you don't care. You don't even care about the little inconsistencies in the plot and some decisions made by the characters in the film. That is the sucking power of this totally necessary production. One of the many pleasures of watching this supple evocative family saga is to see the timeless Sharmila Tagore share screen space with her real-life daughter Soha, who by the way, has never looked lovelier. That inner-glow comes from the company she keeps in this gentle drama suffused in melodious whispers and mellifluent suggestions of tunes long-forgotten and yet stored in the most inviolable chambers of the heart. Luckily for us, and the film, the Sharmila-Soha togetherness is not harped upon. There are far bigger issues and virtues to do with family ties and cultural disaffection secreted in the storytelling, propelling our hearts to soar in ways that modern cinema doesn't allow. When did Indian cinema cease to be about emotions? You wonder as you watch the silken cascade of debutante director Sangeeta Dutta's family secrets and emotions gush out in a Bengali family in London, when one fine morning the mother simply drops dead on the kitchen floor. The mother-figure, a constant and non-negotiable pivot of every family, here seems to be much more in demand than usual. All her three daughters seem to be stricken with heart problems that no cardiologist can tackle. Blessedly, the mother of the family, Manju, is played by the gloriously imposing Sharmila Tagore. 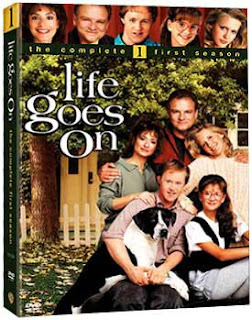 "Life Goes On" captures the suddenness of bereavement in snatches of sounds, visuals and dialogues. There's far more austerity in the expression of the anguish and despair after the sudden bereavement than in Mira Nair's masterly study of coming to terms with death in "The Namesake". At times, you long for more time between the members of the grieving family. There are no big breakdown sequences after the mother's death. Everyone gets busy trying to pick up the threads of life. Everyone is a bit selfish - that's the family secret that the film doesn't get judgemental about. A lot of vignettes connecting the mother's memories to the present times appear predictable, even pedestrian. The director, fearless in her maiden endeavour, doesn't shy away from making her film look familiar. From death to reconciliation, "Life Goes On" moves at a gentle pace. The echoes and resonances of a life that lingers after death is created through a blend of sounds and visuals capturing the feeble but flamboyant light of London at dawn and dusk. The parks, bridges, two-storeyed residential areas and their incriminating quietude are ably captured in the film, as are the pain and postures of grief and mourning. The Rabindra Sangeet in the original Bengali and a rather quaint Hindi translation suffuse a warm and endearing quality to the proceedings. The cross-cultural references resonate across the film's somber skyline with unobtrusive emphasis. The film creates a fine balance between real-life elegies and their cinematic rendition. A lot of Sangeeta Dutta's mise en scene project a first-time director's effusive affinity to creating a defiant poetry out of the prosaic rhythms of life. Life for the Indian Bengali family in Britain never seemed more complex. At times you feel the director has 'Britain' more than she can chew. The sub-plot, on Islam-phobia brought in through Soha's boyfriend Imtiaz (Rez Kempton) and the rock band that he and his friends put together despite Mullahs' objections, seems to go off into tangent away from the Bengali's family's bereavement. But at the end, when we see the band playing a punk version of Hemant Kumar's "Ganga Aaye Kahan Se" laced with a French rap section, you smile for the cultural shifts and translocations that the plot endeavours to establish without falling off the map of the human heart. The performances by veterans Girish Karnad, Om Puri and Sharmila Tagore are uniformly skilled and supple. Among the younger members, Soha Ali Khan as the youngest Cordelia-like daughter to Karnad's King Lear emerges strong and yet vulnerable. But it is the unknown young actress Neerja Naik who plays Soha's lesbian sister, who proves a complete natural. The subtle, delicate and utterly disarming play of light and shade, of mellow memories and the hard present-reality, of the various cultural cross-generation clashes - all these could have made any film heavy. Not "Life Goes On", it is a gloriously polished and a poised look at the chaos that rules the bereaved heart in our troubled times. This film is a triumph on many levels and layers. And you don't have to be a Sharmila Tagore fan to realise how resonant her presence can be even when she is lost to the plot. Clint Eastwood has made a name for himself with his lilting, little gems. He has become an auteur in Hollywood with his own style and pace of filmmaking. Sadly in "Hereafter", he lapses in his own technique, making it a much lesser film than what it could have been. It traces the near-death experiences of individuals scattered across the world. A French journalist dies in the tsunami of 2004 for a few minutes and has a brief experience of the afterlife, only to come back to life. The experience changes her life drastically, leading her to search the afterlife, while unsuccessfully trying to keep the life she knows intact. 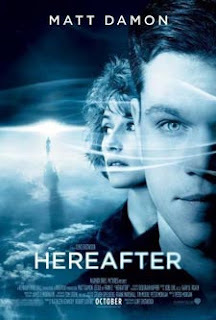 A man in America, after a near death experience in his childhood, can connect with people in the afterlife, but it interferes with his relationships and he wants nothing of it despite the insistence of his brother. A young kid in London is trying to cope with the death of his twin brother, and wants to contact him. The three lives connect in interesting ways that will change the course of each. The intention of Eastwood in this film is noble. Sadly his craft, at least in this film, does not match up to this intention. In interesting ways, Eastwood shows how humans are connected through death. Thus in the Indonesian lives wrecked by the tsunami, the black poor woman in America who's lost a child, or the band of Sikh people mourning a death in the background of the death of the young boy's twin brother, he attempts unifying humanity and bring the thought of afterlife, or after-death -- something that all of us have thought of some time or the other. He also presents the unity of many near-death experiences, of seeing beautiful white light after death and weightlessness and timelessness. In parts, he gets didactic with it, despite an attempted restraint. It could, however, have been done with better story-telling craft and quickening of pace by better editing. Also, in weaving together different stories in the film that necessitates pausing one to jump to another that is not yet interconnected, there is no time or emotion left for the audience to connect well and empathise better with each character. This weakens the emotional appeal of a film that tries telling the story of something we all think about sometime or the other. There is nothing original about "World Invasion: Battle Los Angeles". In brief, it is "Independence Day" meets "Cloverfield" meets "Black Hawk Down" meets "Saving Private Ryan" with state-of-art special effects thrown in. And this, as you would have guessed, makes it a fun film, a total value-for-your-money movie. Gulf War veteran Marine Staff Sergeant Michael (Aaron Eckhart) has put in his papers. But when the world is under attack from an alien race, he unwillingly becomes part of a platoon with zero combat experience to fight an enemy with superior power. As things escalate and most of the air power of the United States is wiped out, it is up to the Staff Sergeant to command the inexperienced group of soldiers and a few civilians to safety. Along the way, he discovers he could be the key to defeating the undefeatable aliens and as the world is retreating to a defence, he and his motley band of soldiers, decide to go on the offensive. "World Invasion" takes itself less seriously than even the fun-film "Independence Day". If you consider the patriotic rhetoric of that film, this is a good thing. And there's no politics of "Saving Private Ryan" either. Though there is a hint of politics when the reason for the invasion is believed to be the one resource that the earth has an abundance of - water - and an expert claims on TV, "Rule of colonisation states that you wipe out the indigenous population. Right now we are being colonised." There was a scope to throw in more of how dominant nations have been doing to their colonies what the aliens are doing to earth - decimating them. That would have made the film much more exciting. "World Invasion" has almost every conceivable cliche of the alien/monster/war movie genre. 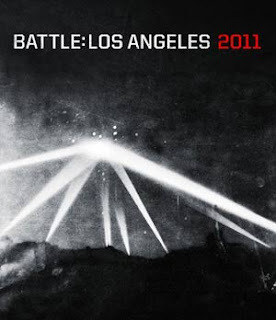 This would have made the film boring had it not been for the gritty ground zero view of a war zone, a la "Black Hawk Down" and "Saving Private Ryan", some breathtaking cinematography and some of the best and most believable special effects in Hollywood. Thus you have the usual sacrifices just at the right time, the fight over who's in command, an unresolved enmity, an unsure commanding officer, a band of brothers unwilling to leave the wounded behind, the usual teasing where you are not shown the full view of the alien for long, a civilian with just the information needed at crucial times, the expected twist in the tale a little after centre point, the usual last crucial missile shot that can save the planet etc. Yet, despite its slightly longish take at over two hours, the film does not get boring or lose momentum at any point. Director Jonathan Liebesman who has given some forgettable films, finally makes one that would be remembered. Writer Christopher Bertolini, who seemed to have disappeared after his delightful screenplay of "The General's Daughter", over a decade back, resurfaces with this film that is just the beginning of a franchise.